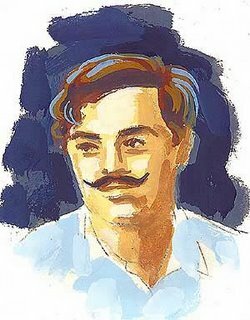 Indscribe's Blog: News and Views about Indian Muslims: On 100th Birth Anniversary Chandrashekhar Azad or Chandrashekhar Tiwari (Jhijhotiya), just a hero of Brahmin sub-caste? On 100th Birth Anniversary Chandrashekhar Azad or Chandrashekhar Tiwari (Jhijhotiya), just a hero of Brahmin sub-caste? It was 100th birth anniversary of legendary freedom fighter Chandrashekhar Azad. Few programmes were held, the TV channels hardly had time to remember a freedom fighter though. Of course, they do remember the birthdays of Shahrukh, Aishwarya and Hrithik every year. Just one event was held on a large scale that included seminar, discussion, competition for kids, speeches and other events spread over two days and that was organised by the Jhijhotiya Brahmin Samaj in my city. The invitation card read Chandrashekhar Azad ie Chandrashekhar Tiwari. He was mentioned as Pride of Jijhotiya Brahmins. So we have fragmented ourselves so much in the last five decades that even a sub-caste wants its own icon. I never knew Azad was Tiwari or even Jhijhotia Brahmin (not kanyakubja or saryupari or bharadwaj) Did you know? He was the pride of India, he has inspired all of us. I remember in my childhood Azad and Bhagat Singh's photographs in offices, shops and houses though its rare to find them now. Azad had died just at the age of 25. And at that young age he had stirred the nation along with the likes of revolutionaries like Ram Prasad Bismil, Ashfaq and Bhagat Singh. I am not angry with the organisation that owned him as hero of this sub-caste. I am sad that rest of us don't seem to remember him as much as we ought to do. At least, Rang De Basanti had seen full houses just a few months back, where is that crowd if our films really affect the youth. And what about Azad. Most of the websites on the net give faulty information about him. The sites including wikipedia, I checked today, mention him as born in Unnao (UP) though he was born in a hut in a small village Bhabhra (Jhabua) in Madhya Pradesh (So at least MP can claim him!). The hut remains a hut, though it is protected. For lesser mortals centenary celebrations are organised and Azad doesn't need to have a celebration to establish him, he is a martyr, a legend but the irony is that we have just forgotten everything. Just the other day I heard someone that Subhash Chandra Bose was a Kayastha hero. Where wll this end? Isn't it all obscene. Rarely nations have got many heroes like the galaxy of heroes India has inherited. So many heroes who can inspire generations and produce men and women of such character and mettle that can show way to world. Alas, we are just not interested. It is more important to learn from our history because Azad, Bismil and Ashfaq were born in the era when communal forces were gaining ground and the British policy was succeding in dividing Hindus and Muslims. But these freedom fighters (Bismil was an Arya Samaji and his affection for Ashfaq is well-knwon) were patriotic to the core, humane and didn't see Indians divided in Hindus and Muslims. Unfortunately today when we should have learned a lot, we have forgotten everything and are hell-bent on killing our common composite culture. Monk starves to death: Is it suicide?